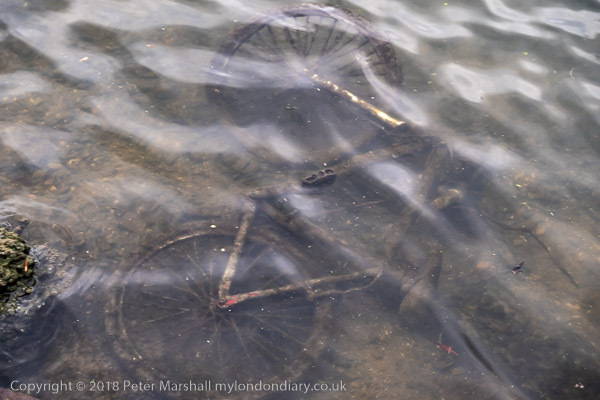 Fortunately it wasn’t my bike at the bottom of the river. 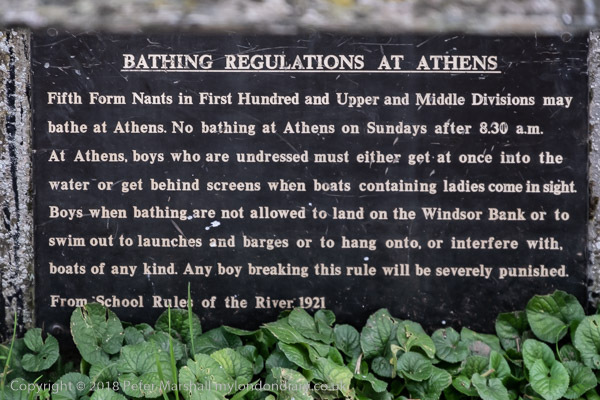 This was the Thames at Athens, a traditional bathing place for Eton boys at Eton Wick, a mile or so from the school. Eton Wick still seems a pretty feudal place, belonging to the school, originally set up to educate poor boys, but at some time stolen from its purpose by the wealthy – along with everything else. And of course it isn’t far from the castle, that great symbol of the power that enabled a few to grab huge estates like Windsor Great Park. Apparently Helch is apparently a “word used to show disgust to peas and landmarks” and while the castle may look quite pretty, what it represents is certainly disgusting. Eton Wick grew up on the western edge of the college’s land to house the workers who kept the college running, though now it is, according at least to estate agents, it is a ‘much sought after Village’. It does at least have a decent small pub, which was like walking into a time warp, and could have been in the middle of the countryside, miles from anywhere, though standing outside there are very frequent reminders that it is not far from take-off at Heathrow, as well as suffering constant traffic noise from the M4. Going across Eton Wick is the huge viaduct bringing a branch line from Slough into Windsor station. 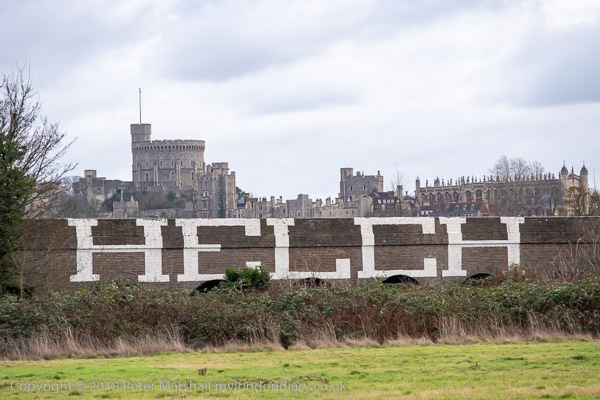 Originally the main Great Western line was planned to go through Windsor, but objections by college and castle led to it being moved north to go through Slough, and Eton held up the building of the branch line for around 14 years. 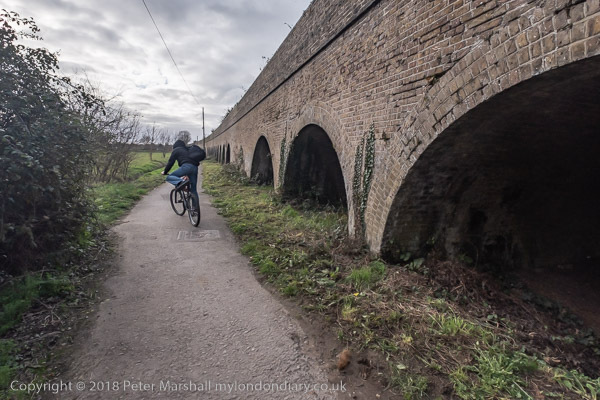 The brick viaduct replaced an earlier trestle viaduct in the 1860s, and although it is often said it was designed by Brunel he died before it was built. The line and the wrought iron bridge which carries the railway across the Thames was designed by Brunel. 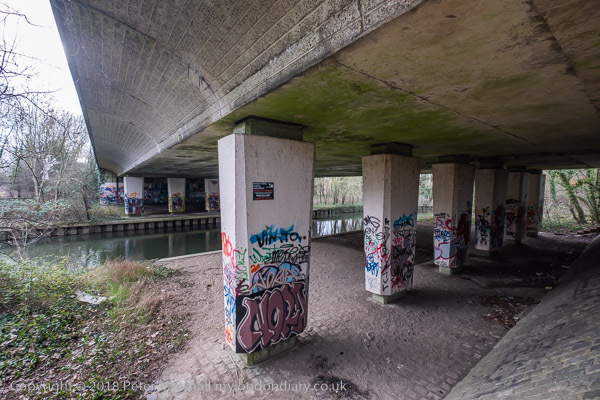 Also crossing the fields of Eton Wick is the A322 Royal Windsor Way, a rather later structure, built in 1966; four years later the old bridge between Windsor and Eton was closed to traffic as it was cracking up, so this is now takes all the traffic between the two. We went under this where it crosses a backwater of the Thames, which meets the main river a short distance upriver, close to Athens. I couldn’t resist taking another picture of the ‘Bathing Regulations at Atens’ taken from the 1921 ‘School Rules of the River’. This entry was posted on Sunday, April 14th, 2019 at 08:51 am and is filed under My Own Work. You can follow any responses to this entry through the RSS 2.0 feed. You can leave a response, or trackback from your own site.